In a far away place, that can’t be reached, a flock of chickens forages in the tall swaying grasses of a beautiful meadow. The meadow is peppered with stands of trees and a golden light makes the green of the grasses seem to give off a golden green glow. A slight breeze blows over the grasses. He lays in a clearing, curled on his side. Dappled sunlight plays across his face. He stirs, but doesn’t immediately awaken. A black and blue butterfly lands on his arm and quickly takes off again as he stirs a second time. He opens his eyes with a start. He has no idea where he is. He pushes his upper body up with his arms and gazes over the golden lit green meadow. He stands and brushes himself off and his eyes are filled with fear. He can’t remember how he got there…what the hell had happened. In the distance, a rooster crows. Once…then again. Prince detects something new in the meadow. He knows it’s not anything to worry about, but he likes to alert the flock, nonetheless. He stops crowing and listens for a moment. He hears something familiar…a footstep and a stride coming toward the flock through the swaying grasses. He makes an exciting burbling sound to the rest of the flock and they gather behind him, looking curiously in the direction of Prince’s gaze. They cluck softly and some return to scratching the dirt. Prince crows again. The footsteps come faster. Prince begins running toward the brook where he knows he’ll find the source of the steps. The hens run behind him, overtaking him when they arrive at a bridge. It spans a wide stream that sparkles in the golden green light of the meadow. He stops. Before him is a bridge over a stream. The bridge is ornately carved with figures and animals. He stares at it…takes more steps toward it and stops again. Standing on the bridge, is a flock of chickens…mostly hens and a lavender Rooster. The rooster throws back his head and crows. The flock stops and seems to wait for him in the middle of the magnificent bridge. Suddenly, he recognizes them! Nina, Mary, Ruth, Opal, Oprah and Jessie. 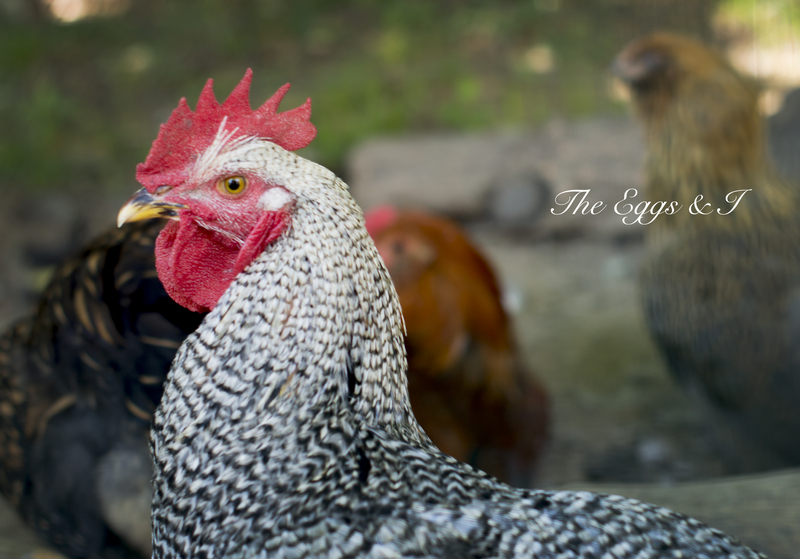 They were HER hens…and standing behind them was Prince, the magnificent rooster who he’d personally tried to nurse back to health until he had to be put down. A realization begins to fill his mind. He knows now where he is, memories begin to flood his mind of her coming to the hospital, of her collapsing in his room, of the room being filled with people, and then suddenly…the people were gone and it was just her and Greg. He tried to stop their weeping, but they couldn’t hear him. He remembers saying ” I’m HERE! !” but they never stopped crying. He remembers a day hovering near her while she was awash in tears, never stopping, hardly breathing, not believing. Then he awakened here. In this beautiful place. He looks at the bridge again…now knowing its significance and he slowly begins striding toward it, where the flock of chickens stands waiting. He crosses the bridge to the middle where the chickens flock about him. His boots make a hollow sound on the bridge and the Light seems to brighten in the meadow as arrives at the other side. The chickens chatter with excitement and Prince crows. The Chicken Keeper has come home. Me again! 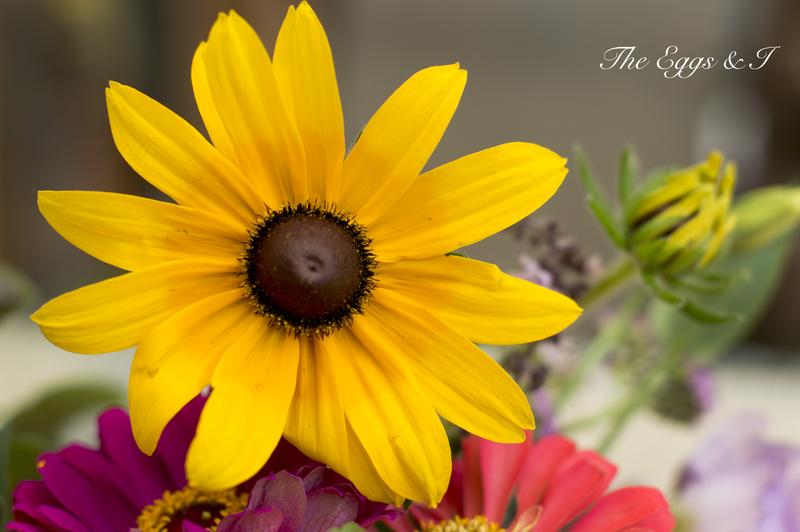 I’ve decided to move to a self hosting blog platform. I’m doing the behind the scenes work today, but the site is stable. You may see things change off and on as I work on the look that I want. If you are a subscriber and do not receive update emails in the future, please subscribe again. Transferring is not a fool-proof process. I have redirected the address to the new address. For your information though, the new site is http://www.the-eggs-and-i.com. See you over there! It’s been an interesting morning. Vinnie lost his virginity last night and had the nerve to do it in front of Mr. Head Rooster In Charge, Cluck. After Vinnie did the deed with one of the Wyandottes, he was feeling pretty proud of himself until Cluck tried to rip his head off. I have never seen two chickens run that fast…EVER. I got everyone inside and settled down and on the roosting bar and they all went to sleep as usual. This morning, I went out to let them out of the run and oddly, they were still in bed (on the roost). I opened the door, told them they were lazy buggers and went to get Vi and Amy set up for the day in the grow out pen. The MINUTE I turned my back, Cluck went after Vinnie again and it was horrible. 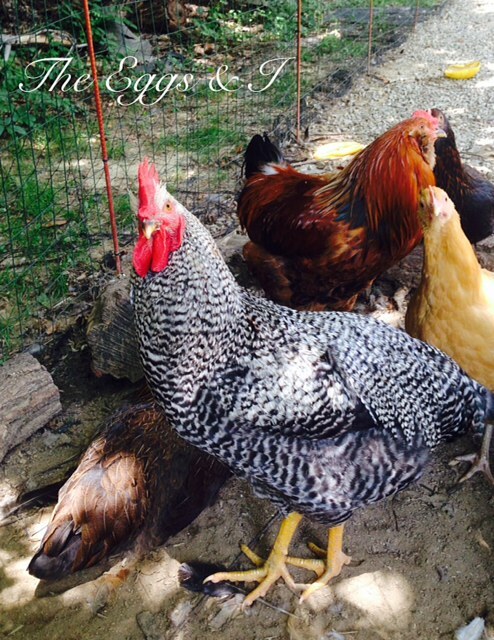 Just a note…”STOP IT YOU (expletive deleted)” does not phase roosters. 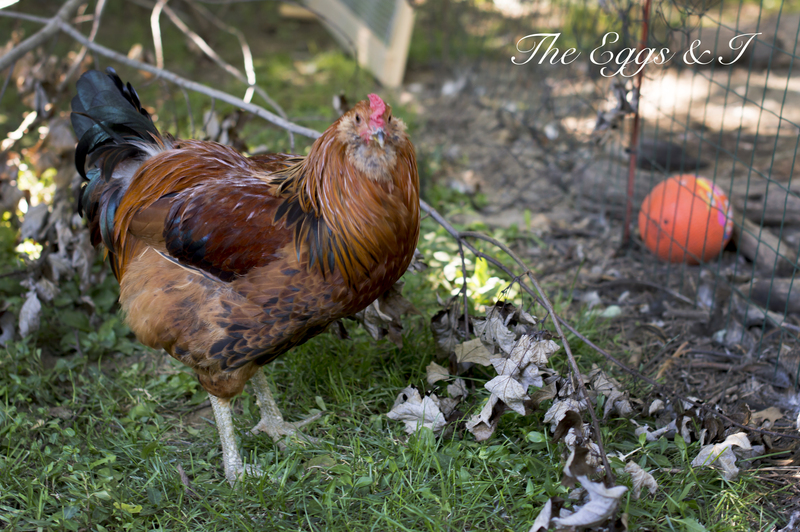 Vinnie ran for his life, really…he did…and Cluck was right on his tail. I’ve never seen Cluck that angry. He finally got Vinnie in a corner and that’s when I stepped in…like an idiot. I grabbed Cluck and hefted him across the coop and then I chased him out into the run and shut the run door so that Vinnie could get himself together. He wasn’t hurt, but he was really, really frightened and upset. Cluck was out in the run griping up a storm and probably describing in rooster language, what he was going to do to Vinnie when he caught him. I threw scratch into the run to get the hens busy because they were agitated. I threw a couple of harmless, well-aimed handfuls of scratch at Cluck just to remind him to mind his manners. Once Cluck dropped his head to peck for scratch, I went back into the coop and found Vinnie standing on the highest roost, clucking nervously. I opened the run door….and hoped for the best. I had to get ready for work. Before I left, I told Tom that if it kept up and it looked like Cluck was going to harm Vinnie…that he should feel free to dispatch Cluck to the Chicken Coop In the Sky. It broke my heart to say it. 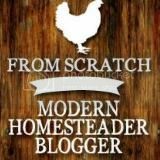 I contacted some friends that are experienced with having two roosters and they recommended that I wait before we go that route. They said that I’m best to let the two of them work it out. They’re right. I also know I need to stay out of it so that I don’t make it worse for Vinnie and so that I don’t get hurt by either of them. This is the really hard part of chicken keeping. I treat them as pets and truly, they’re farm animals. They can’t be domesticated like a dog or cat because they are SO hard-wired to be what they are…chickens. I think it was a good lesson for me this morning. I think Cluck and Vinnie might have learned a couple of things too. 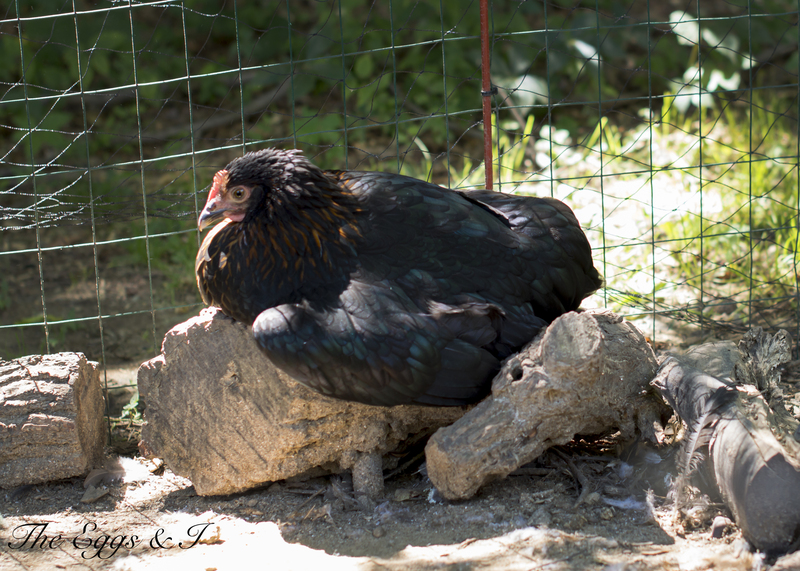 Tom called me later and said that they were sitting side by side in the dust bath, preening, surrounded by hens. I guess next time, because there will be a next time, I just let them do their thing and fight it out. I might blast them with the hose, though. It’s probably not recommended, but dang it, a little operant conditioning never hurt anyone. So Cluck, here’s the deal. Attack the zebra striped one and you both get wet. Got it? I think these two are simply adorable. The one the left is Violet and the one on the right is Amy. I gave them a bath this morning. FIRST CHICKEN BATH EVER! For me, I mean. I had no idea how to do it, so I read a couple of things on-line and then I remembered that I used to be a neonatal intensive care nurse and darn it, if I can wash a baby over the sink, I can wash a chicken! I used the sink in the laundry room (and I’ll clean it with 43.5 bottles of bleach now). I went out and picked up a chick, brought her inside, held her in one arm while I started the water with the other and tested the temperature with the inside of my wrist (GO MOM INSTINCTS!). When the water was warm but not hot, I did what we used to do with the babies…I just ran the dirty parts under the stream of warm water. I put on a tiny bit of Dawn dish soap and made sure everything was clean, checked for mites, and then rinsed, rinsed, rinsed. DONE. I took her back to the pen after I’d blotted her off with a towel and put her in the grass. I grabbed her sister and went back to the laundry room and lathered, rinsed and repeated for her. Blot, blot, blot…back to the pen. They never struggled, I didn’t have any problems catching them, they never chirped like they were afraid…I was totally unprepared for such cooperation! I expected scratching, screaming and crying! 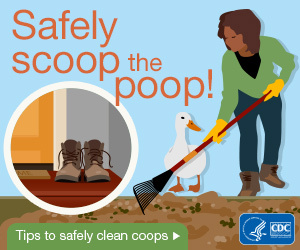 And I thought the chickens would misbehave too. 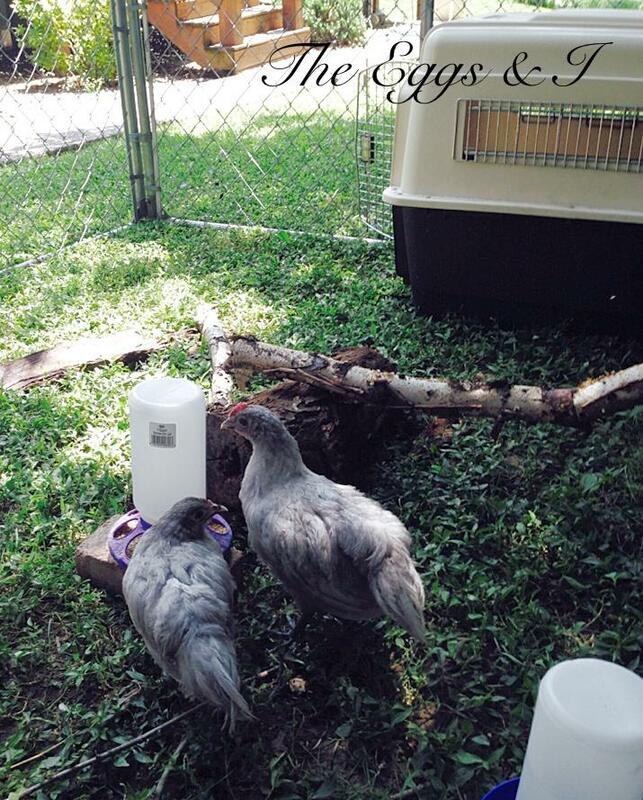 We picked up the lavender Orpington pullets yesterday. THEY’RE ADORABLE! Of course, you knew they would be. I mean, they’re baby chickens after all. When we got home, we put their carrier into the pen that we’d prepared for them and they happily pecked around in the grass, had a big drink of water and ate an entire bowl of food. I THINK one might be a rooster. I’m not sure, but the comb is considerably bigger than the other’s. I’ll just have to wait to see how it grows and if it crows. Speaking of crowing…there was a little bit of unhappiness and anxiety from the Beaked Wonders…especially, this guy. He stopped griping and just stared at the two new babies who were some distance away in their pen happily ripping up the grass and sucking down scratch. I have a feeling that when the new babies are big enough to join the others in the run, I’ll be moving Vinnie to his very own bachelor pad. I’m sure he’ll have something to say about that too. We interrupt your Saturday to bring you complete coverage of Oprah Wingfrey’s sunbath. Reportedly, Oprah says that this is all she’s doing all day today. What are you up to? He’s an official member of the “Free-Range Club” here at Beaked Wonder Ranchette. The farmer’s market this morning was small, but we found fresh peaches, new potatoes and green beans. 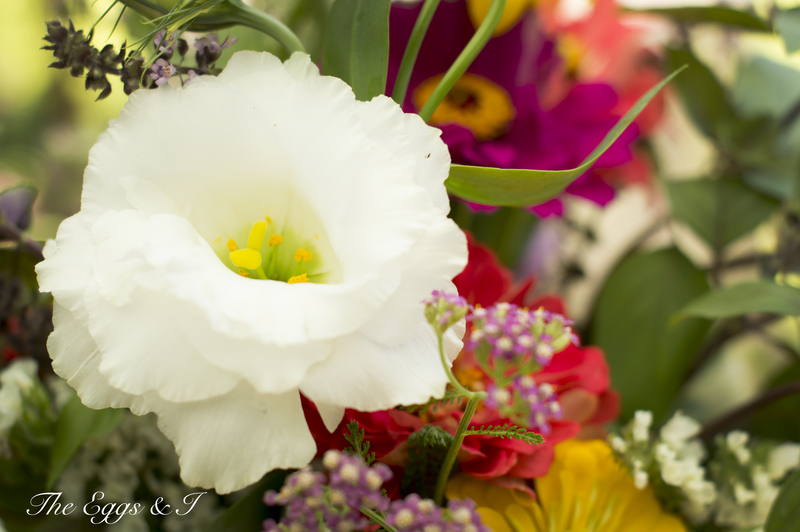 We bought a beautiful loaf of cheddar garlic bread from a local artisan baker and I also bought beautiful flowers! 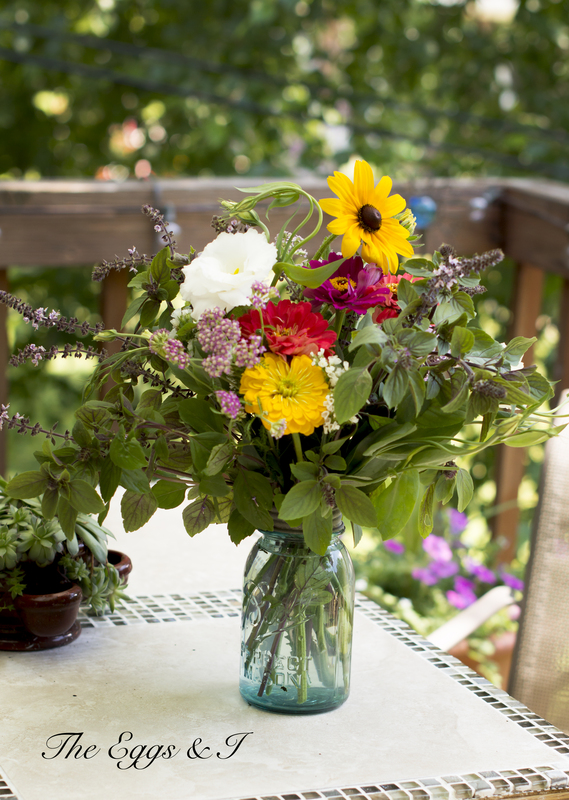 I’m not very good at arranging things, but I think you could stuff these in a tin can and they’d still look incredible. They’re like nature’s fireworks! I took a few photos to share. Okay, you have FIVE more days until my birthday. Just mail me a chicken. I can’t turn down presents right? Tom will have to let me keep them because, we wouldn’t want to seem rude now, would we? The boy is obsessed with blowing things to bits. 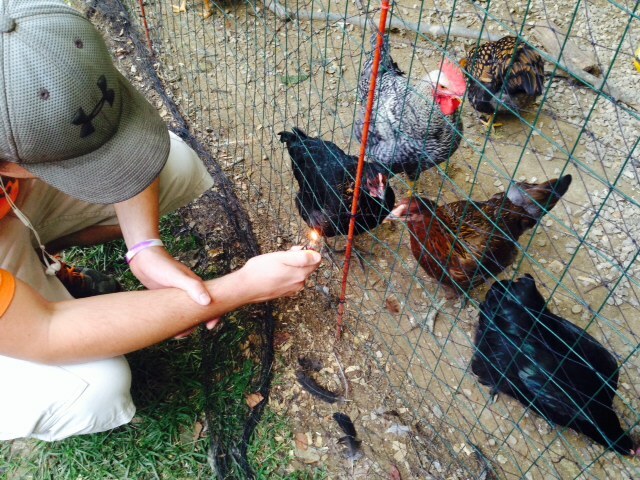 In other news, Greg taught the chickens all about fireworks safety. I told them that if they play with fire, they’ll wet the bed. We both thought they were a little TOO interested in the fire when Greg lit the lighter. This could be an issue. We are going to the farmers market this morning and then hanging around the hacienda and cooking on the grill. If the chickens behave, I might give them a treat of strawberry tops because I’m baking a strawberry cake with cream cheese icing for Tom’s mom’s birthday. I figure by late afternoon, I’ll be treating a minor burn somewhere on Greg. Several times throughout the day, I’ll peel various dogs off the ceiling. At some point, I’ll have probably had too much wine and leave an important ingredient out of a recipe. So, it should be a pretty good day. I hope you have a great Fourth too! NOT I should go clean that bathroom before our house is deemed unfit to live in. NOT should I go try to chip that cheese off of the side of the au gratin potato pan from the night before last. NOT I should do laundry because I’m out of underwear.